Sometimes a game brings out the best and the worst in Retro Gaming. Y'see, there's a big difference between playing a game in the way it was meant to be played, and then reliving it years later through an emulator or something. Or at least, it seems that way with me. If I played an Arcade Game, I'd expect to get as far as I can through it every time. By that I mean, I learned the right tactic to employ to get to a certain point, and that's where I'd try and reach, normally in one credit. 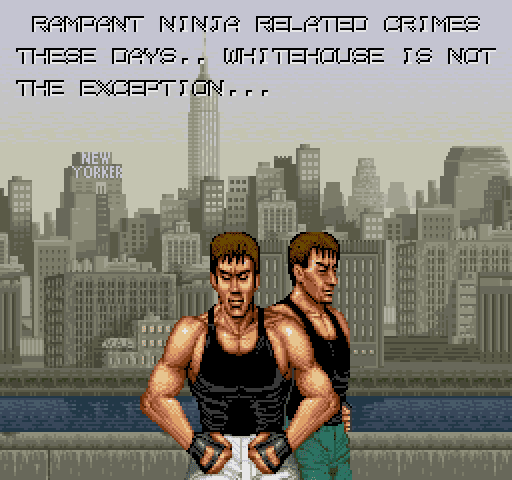 Normally, for example, I'd expect to complete Time Crisis 2 with one credit, I'd expect to complete Double Dragon in one credit, I'd expect to get to level 3 of DragonNinja (but only just), and half-way through the first level of Ghosts 'n' Goblins. I was crap at Ghosts 'n' Goblins. Anyway, on that basis, DragonNinja was great. It was also great in that it brought us one of the earliest and most iconic "Intro sequences" seen in games. "President Ronnie has been kidnapped by the ninjas", you are told. Fantastic, do ninjas tend to take hostages these days? 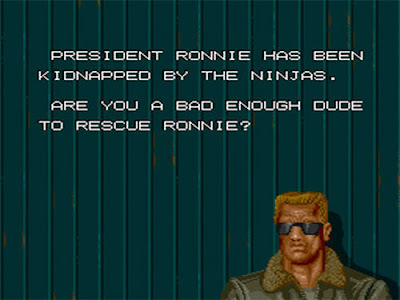 "Are you a bad enough dud to rescue Ronnie"? Except I wasn't. I never got close until MAME came along. And that's where this game suddenly becomes very very bad. Well, not bad as such, but MAME showed me what I would have had to deal with if I'd ever been brave enough to shove another credit in after I'd reached my "limit". And trust me, it would have meant my next credit would have been over in about twenty seconds. And the next. And... you get the idea. DragonNinja starts off with enough enemies to cause you problems and test your reactions and control of the game, but not too much to make progress impossible. The game's difficulty really rises with the level 2 boss, and then level 3 becomes almost as ridiculous as a "Bullet Hell Shmup". 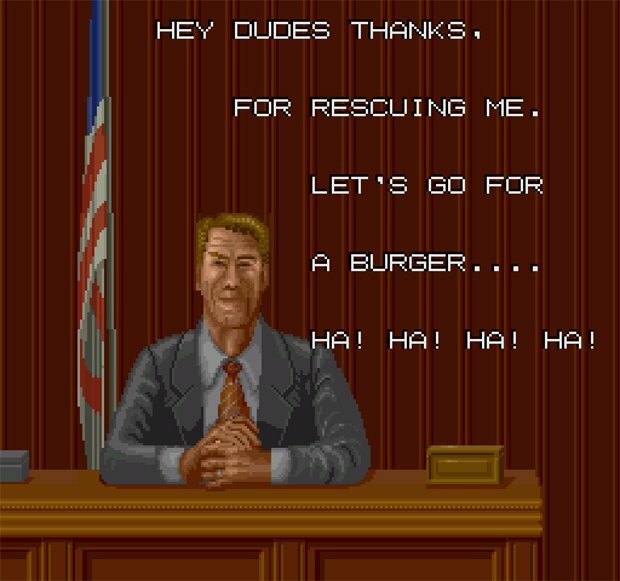 So, yes, I've seen the ending (And it's almost as funny as Zangief's ending in Street Fighter II), but I urge you to play the game on one credit, and not spoil what is essentially good, solid fun until you reach that point. The different attacks are easy enough and obvious enough to pull off. Pressing attack will punch. Combine it with moving the joystick in the opposite way to which you are facing, and you'll perform a rear-kick. Pressing down will allow you to leg sweep. You can even do a spinning flying kick thing. But hold down the attack button for a couple of seconds and your shoulders set on fire, releasing the button will unleash a much more powerful attack which can either cause serious damage to a boss, or take out several single-hit enemies at once. Marvellous. Some enemies carry weapons, such as swords and throwing stars, others will drop handy weapons like knives and nunchucks (or energy or time). None of which will do you any good come level 3. Data East, probably best remembered for their awesome arcade version of Robocop, use their typical graphical style to nice effect, but there's one scene fondly remembered by most Arcade Gamers worth their salt... the second level's truck-top fight. If there's no other reason to play Bad Dudes, this level alone is worth your time. Without being an outstanding game, it's an iconic reminder of games of yesteryear. Nice article, Fishta! 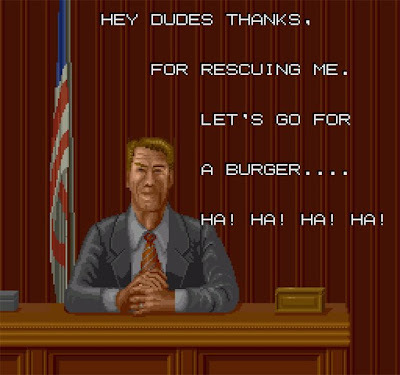 Most arcade games become a little meaningless when you pump in the credits on MAME. The challenge was part of the appeal of a real arcade cab, so why diminish that? I may do it for one playthrough in order to see all a game has to offer, but when playing for real, it's one credit only!